Steve Grossman, Damon Brown, Peter King. A saxophonist friend once spent a summer sharing a flat in Rome with Steve Grossman. When Grossman lent him his sax, he thought he’d do Grossman a favour by cleaning out the nicotine-filled mouthpiece. Grossman was horrified: `You’ve changed my sound, man!’ That was long ago, and fortunately Grossman’s sound was as enthralling as ever for this gig, rich yet acerbic, like whisky and cream. Born in Brooklyn, famous for getting the call from Miles Davis when aged 18, Grossman’s now resident in Italy. They opened with Grossman’s hard bop Blues for Damon. Trumpeter Damon Brown told us it had been written after Brown had ‘bought him lunch’! With his flowing hair and beard and air of gravitas, Grossman looked and sounded prophetic. He’s named Sonny Rollins as an influence and there was some of the latter’s rhythmic throatiness in the sound. I’m Confessin’ followed, which Grossman has recorded with gentle trumpeter Tom Harrell. It was interesting to contrast it with Brown`s take on the tune. Brown’s playing is always exhilarating and perfectly-phrased. He was like a jazz raconteur- he repeated a phrase for emphasis, played some robust blasting high notes then ran down the notes, getting quieter and more conspiratorial. You wanted to follow everything he had to say. He was a perfect foil for Grossman’s darker complex harmony, which evoked late Coltrane. You could hear the history (and future) of jazz saxophone in his tobacco tone in the fast swing There`s a Small Hotel. Grossman started playing Charlie Parker aged 8, and everything he played tonight sounded completely natural, as if he’d lived it- toughness and vulnerability in equal parts. Munich’s Martin Zenker played a very agile bass solo with fast bop lines- the audience loved it. East of the Sun and West of the Moon had Brown playing in bright primary colours against Grossman`s chiaroscuro. UK alto saxist Peter King joined them for the second set. Elvin Jones has called him ‘a master of his instrument’, and his bebop style was incredibly fast and liquid, like the tide rushing in between the chords. Grossman responded boppily with his dry-edged tone. In one interview Grossman has said he never knew what to play for Miles’ rock fusion projects in the early 70s. (Jack Johnson, Live-Evil) After they parted company, Miles wanted him to rejoin the band, but Grossman preferred to stay with Elvin Jones’ groups. 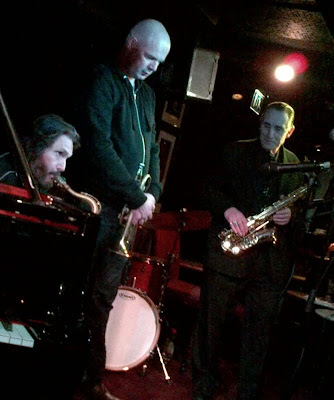 He sounded completely at home playing over UK drummer Matt Skelton`s sympathetic swing and Zenker’s strong pulse. Joyspring, with its upward chord modulations, is uplifting all by itself and to hear these three horn players interpreting the harmony was a revelation. King`s notes seemed to bounce back from the beat. Grossman’s solo had the familiar shape of bebop but with wonderfully unexpected notes. When all three horns improvised together at the end the blend of their distinctive voices was exceptional. Dave Liebman, who played sax with Grossman on the iconic `Elvin Jones Live at the Lighthouse’ 70s recording, talks of their 60s free jazz influences- you could hear them in Grossman’s elemental, growly split harmonics in On Green Dolphin Street. Edinburgh pianist Paul Kirby played a riveting solo, with his fine Wynton Kelly-ish sense of swing and McCoy Tyner flourishes. I’m looking forward to the next one too.